Slow down. Avoid strenuous activity. If you must work outside, try to do it during the coolest part of the day – usually in the early morning. Stay indoors as much as possible. If you don’t have air conditioning, stay on the lowest floor of a building out of the sun. Use electric fans if you have them.They don’t cool the air, but they do help sweat to evaporate, which cools your body. Drink plenty of water regularly, even if you don’t feel thirsty. Your body needs fluids to keep cool. Avoid beverages with caffeine, such as coffee, and alcohol. Eat smaller meals, but eat more often. Wear loose, lightweight, light-colored clothing and a hat. Light colors reflect heat and sunlight and help your body maintain normal temperatures. Don’t get too much sun. Sunburn makes the body’s job of keeping cool more difficult. 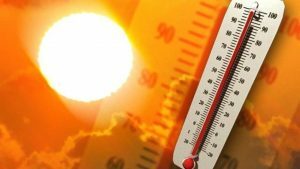 Check on the elderly, children, and those who are ill; all are vulnerable to excessive heat. Ensure that your pets are provided with shade and adequate water.